Conquest Tsunami went straight to the lead and never looked back to capture the first 2-year-old stakes of the Woodbine meet Saturday, the $148,250 Victoria. Patrick Husbands was just along for the ride aboard Conquest Tsunami, who won the Victoria by 7 3/4 lengths Saturday. Conquest Tsunami ($2.90) prevailed by 7 3/4 lengths under Patrick Husbands, while covering the five-furlong distance in a quick 57.91. After missing the break, Honkeytonk Man rallied wide for second at 23-1. Her rider, Chantal Sutherland-Kruse, claimed foul against the winner for interference at the break, but the result stood. R U Watchingbud outran 9-5 second choice Creaky Cricket for third, and Less Than Perfect trailed in fifth. Conquest Typhoon was scratched. 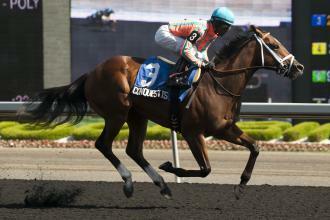 It was the fourth win in the Victoria for trainer Mark Casse, and the second for Conquest Stable. They combined to win last year’s edition with Conquest Whiplash. Conquest Tsunami, who won his only other outing in a maiden special at Keeneland, earned $90,000.